There are often calls for stricter regulation, in particular the idea that in the US they arrest people in banks with greater ease/faster (which is in itself not ‘regulation’ it is policing). Anyway, I thought it was worth mentioning that in the US it isn’t a ‘one Regulator fits all’, and that the problems we had in the past through division of regulatory responsibility [splitting Central Bank and Regulator] still exist there. Below is a graph of how responsibility is divided out in America. 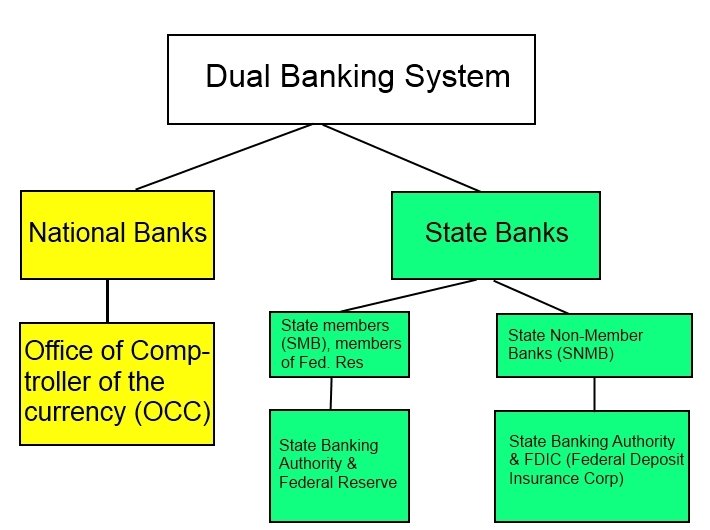 As you can see, the OCC takes care of national banks, then the very popular state & community bank sector is elsewhere. Taking State banks in particular, they either have access to the Federal Reserve or not, if they do they are SMB and the State Authority and Fed are the regulators, if not then they are SNMB and the State Authority and the FDIC are the regulators. That is why you hear about the FDIC ‘going into banks’ – these are state banks that are at risk. The national banks would be more in the OCC/SEC/Fed sphere of influence. Just an interesting point, because the US still has divided regulation and that is sometimes cited as one of the issues that saw the credit crunch occur without warning.